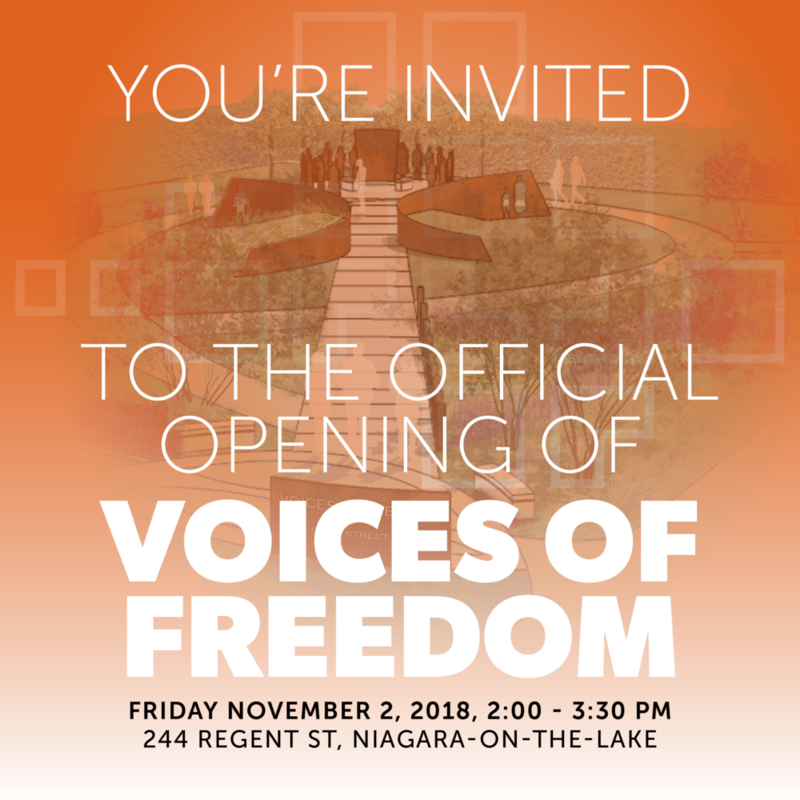 Voices of Freedom Park officially opens November 2, 2018, 2 pm at 244 Regent Street, Niagara-on-the-Lake. Voices of Freedom Park gives expression to the silenced and forgotten stories of people of African descent, enslaved, freed, and free, whose sacrifices, labour, skills, and talents contributed to the development of Niagara-on-the-Lake. This significant art installation in the heart of Old Town Niagara-on-the-Lake permanently inscribes these Black men and women on the historical and cultural landscape of the Town. Curated by Bravo Niagara!, the official opening performances will feature acclaimed vocalist Alana Bridgewater, JUNO-winning pianist Robi Botos, and Shaw Festival actor Allan Louis. On November 3rd, Bravo Niagara! presents the Voices of Freedom Concert at the FirstOntario Performing Arts Centre in St. Catharines. The concert comes one day after the official opening of the Town of Niagara-on-the-Lake’s Voices of Freedom Park, dedicated to commemorating Niagara-on-the-Lake’s Black history and the 225th Anniversary of the Act to Limit Slavery in Upper Canada. Curated by Céline Peterson, daughter of legendary Canadian jazz pianist Oscar Peterson, the Voices of Freedom Concert will bring together some of the best in Canadian jazz and soulful music to highlight inclusiveness, empowerment, and the importance of freedom. “The entire Voices of Freedom concept excited me from the moment I first heard about the project. The park, the concert – it’s all such a beautiful and meaningful celebration,” says Céline Peterson, Artistic Producer and host of the Voices of Freedom Concert. The evening will feature performances by Officer of the Order of Canada, singer/songwriter and philanthropist Molly Johnson. The concert will also feature NAACP Image Award, Gemini, Dora, and JUNO Award-winning singer/actress Jackie Richardson, as well as performances by Grammy Award winner Larnell Lewis on drums (Snarky Puppy), multi-JUNO Award winners Robi Botos on piano and Mike Downes on bass, and up and coming saxophonist from Barbados, Joseph Callender. These all-star Canadian artists will be joined by 80 students from the Laura Secord Secondary School Concert Choir. For tickets and more information, visit www.bravoniagara.org/vofconcert. Don’t miss this moving, inspirational event! Book your stay!